Were you looking for Lumber Liquidators Defective Flooring Class Action Lawsuit Filed lawsuits? Lumber Liquidators faces lawsuits across the US alleging the company's Chinese flooring products are toxic, emitting high levels of formaldehyde. Lumber Liquidators defective flooring class action lawsuits were filed as far back as 2013 but more lawsuits have since been filed in various states across the US since a 60 Minutes investigation suggested high levels of formaldehyde in the flooring products. These defective products lawsuits claim homes lost their value because of the use of the flooring. Send your Lumber Liquidators claim to a lawyer who will review your claim at NO COST or obligation. Lumber Liquidators lawsuits have been filed against the flooring company in various states across the US, including California, Virginia and Florida. The lawsuits seek damages for consumers who bought flooring products from the company in the past four years, and further seek an injunction preventing Lumber Liquidators from selling certain laminate flooring. Specifically, the lawsuits allege that certain laminate flooring from Lumber Liquidators has unacceptably high levels of formaldehyde, putting residents at risk of health problems and negatively affecting home values. Some plaintiffs allege homeowners have suffered symptoms such as shortness of breath, weakness and fatigue after using certain laminate flooring from Lumber Liquidators. Lawsuits have also been filed in California and South Carolina accusing Lumber Liquidators of false advertising for its claims that its flooring complies with advanced environmental requirements. At least one lawsuit also claims Lumber Liquidators knew or should have known its flooring came from endangered habitats. Plaintiffs in the various lawsuits argue they either would have paid less for the flooring or not purchased it at all had they known that about the formaldehyde levels. The Centers for Disease Control and Prevention have issued a statement that some types of laminate flooring made by Lumber Liquidators may be linked to a greater risk of cancer or other health problems than previously thought. The CDC conducted an investigation into Lumber Liquidators' laminate flooring and found that formaldehyde levels in some of the flooring could be linked to between six and 30 cases of cancer per 100,000 people. Other health issues could include asthma, or eye, nose, and throat irritation. 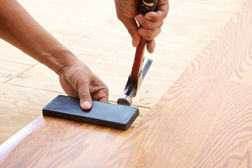 According to a CBS 60 Minutes report (3/1/15), certain laminate flooring made in China contains excessive amounts of formaldehyde, a carcinogen linked to some cancers and respiratory problems. An investigation by 60 Minutes found that of 31 samples of laminate flooring from Lumber Liquidators, 30 failed to meet formaldehyde emissions standards, with some samples showing more than 13 times the California limit. 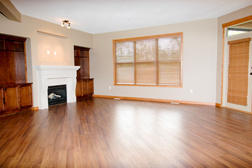 The 60 Minutes report suggested that hundreds of thousands of homes in the US may have the Chinese laminate flooring. Among the steps people can take to reduce the level of formaldehyde in their home are opening windows, using exhaust fans, and keeping temperature and humidity low. Residents who smell strong chemical odors or have breathing problems only at home are encouraged to have their home formaldehyde levels tested. Lumber Liquidators has said that it stands behind the safety of its products and that all products meet required environmental standards. According to reports, Lumber Liquidators is the largest and fastest-growing hardwood-flooring retailer in North America. The company has more than 360 stores in 46 states, but has also faced an investigation for allegedly buying wood that was illegally logged. According to reports, Lumber Liquidators recently agreed to pay $13.15 million in penalties to settle the allegations. The company will also agree to independent audits to ensure it complies with environmental laws. CEO Lynch Out, Fortunes Continue to Fall for .. Does Your Laminate Flooring Have Too Much For..
Lumber Liquidators Halts Sales of Allegedly T..
From Bad to Worse for Lumber Liquidators Toxi..
New Class-Action Lumber Liquidators Formaldeh.. I would like to know if this problem includes vinyl plank that is not a laminate. We also have issues with planks cupping and separating. LL of course says it is installer issues, a professional laud floor. I urge anyone who has bought and installed these floors in question to call the Federal Trade Commission and file a consumer complaint as soon as possible. Their number is 1-877-382-4357. I purchased the 12mm Dream Home St. James Vintners Reserve laminate flooring in March 2015 and installed them in my living room. I just found out about this whole issue two days ago!!!! In my floors have not been tested as of yet, I am waiting on the free test kit to come in sent from LL. I have read many nightmare stories about their testing method, waiting time, testing lab being under investigation and blah blah blah... I do not know what to believe. But my family is my priority and that is all that should matter. We have contacted several lawyers and they are either no longer taking anymore clients or have already settled! So looks like I am going have to go rogue! It is my opinion that whether my floors end up testing within normal parameters or not, LL knew they were selling me a questionable product at the time that could put my household in danger with some serious health risks and therefore had no business in selling those products to me or any other consumer for that matter. I just bought flooring from lumber liquidators how can i know if mine is safe??????? I wish to know if the flooring in my home was purchased by Home Depot from Lumber Liquidators Inc. This is now discontinued at Home Depot. So I am worried that it may be some of the bad stuff that needs to be removed for our health in this home.